Mr. Allu Hanumareddy project, a project executed by us is published as a success story in news paper cutting today. While I did not know what being a farmer really was, his words made me believe it was not ‘cool’. Farming seemed like an occupation for those who did not have other options, an occupation without dignity. In class 10, most of my 50 classmates wanted to be engineers and doctors, a handful wanted to be pilots, and I chose to be a chartered accountant. No one wanted to be a farmer. India has about 250 million people earning their livelihoods from farming, but three out of four farmers want to quit and find an alternative job. 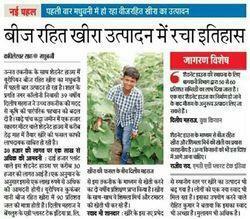 Three out of five farmers want their children to settle in cities and stay away from farming forever. Out of the 570 million farms across the world, almost 50 per cent are in lower-income countries. So, I believe that the situation is not too different in Africa and Latin America too. With this dismal picture, goals like the UN’s ‘Zero Hunger’ seem unrealistic. Forget about being able to feed the estimated global population of 9.7 billion by 2050; especially given challenges such as climate change and rapid urbanisation, we won’t be able to feed the existing population if people want to stay away from farming. So, the big challenge is: How can agriculture be made an appealing profession for children and youth? The first place to go to is schools. Generally, students select a career aligned with what they studied. In the case of agriculture, the subject is not formally learned at school. Unless one grows up on or near a farm, one does not gain exposure to farming. An ideal outcome from these two strategies is that more children will enter farming by choice rather than as a compulsion. This way, the next generation of farmers will be educated, innovative, and business-minded. Today, the small number of educated farmers is thriving. For instance, an equity researcher-turned-farmer named Ayush Sharma is working towards changing the lives of tens of hundreds of farmers in the State of Telangana by providing training on production practices and by creating market linkages. Harvard graduate-turned-farmer Siddharth Tata is influencing the lives of more than 500 vegetable farmers in creating an ecosystem for safe food. Even with more exposure to agriculture, the traditionally low income of farmers may still make it a less desirable field than the legal or medical fields. There are efforts under way, however, to make farming more cost-effective. For instance, at Kheyti, , we created a model where farmers with 50 minutes of labour and 500 litres of water a day can earn ?? ?5,000 profit in just 200 sq m of land. Another example is that of Agriplast, founded by IIT Kharagpur alumnus Rajeeb Roy, which is working towards innovating and bringing the latest hi-tech farming technologies in India, and is helping attract professionals to farming. In the words of food activist Alice Waters, teaching kids how to feed themselves and how to live in a community responsibly is the centre of an education. As much as pure ‘academic’ subjects are important in schools, hands-on lessons blended with vocational training must be treated as equally important; it is one of the main ways that countries in the global south can leave poverty. Bringing agriculture to mainstream education has the potential to feed the world. In Kolamasanapalli, Palamner, Chittur, on the southeastern coast of India, a former textiles businessman recently took on a new challenge becoming a greenhouse grower. Mr. Tribhuwan started his venture when he lost a lot of money in the textile business and decided that he wanted to take advantage of the opportunities in the upcoming greenhouse industry in his area. He started to grow in a 2,080 square meter plastic polyhouse and planted his first crops on October 13 last year. He was backed by the knowledge and support of Indian agriculture and horticulture supply company Agriplast, who consulted him with services and guidance of new products and use of advanced materials. 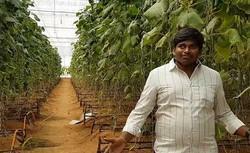 In a recent video from Agriplast, the Indian newbie greenhouse grower shares his story and explains how the movable Aluminet screening solution from Agriplast helped him to produce a total of 33 tons of cucumbers between October 13 and March 8, 2017. Mr. Tribhuwan sells the cucumbers at an average price of 16 Rs. per kilo, which is equivalent to 23 euro cent per kilo. 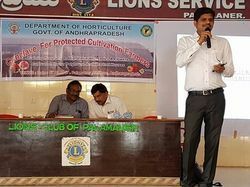 Farmers training today at Palamner by our Director Shivanna Chandru.